You don't really know much about me and my taste in comics, even if you've been reading all my reviews religiously. For instance, did you know I hate Kang the Conqueror? So much, you guys. It's totally not funny. Today I put a footnote on that hate: I am totally OK with Kang - maybe even a fan - when he's the comedic antagonist in a ridiculously complicated Squirrel Girl time-travel adventure. Force Kang to operate strictly along "Bill and Ted's Excellent Adventure" time-travel rules and he becomes outstanding. It helps to set him up for easy foiling within a single issue instead of making his defeat a year-long saga, too. Ryan North provides a triple dose of clever and funny with this script. 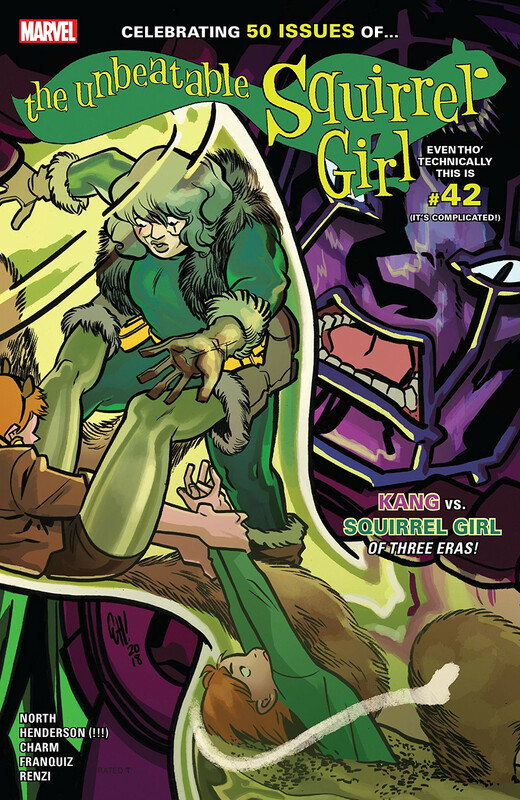 Kang's repeated attempts to kill Squirrel Girl by leaping further and further back in her timeline only serve to unite Present Doreen, Old Lady Doreen, and Kid Doreen (with Monkey Joe, yay!) against him. And as we all know, three Squirrel Girls is three times as much power as it takes to defeat any Marvel villain. The defeating is delightful, even if it does lean on classic Squirrel Girl moves (Squirrel Swarm!) and remind you more than a bit of the time she got stuck in the 1960s with Dr. Doom. I was not the biggest fan of Naomi Franquiz's first swing at drawing Squirrel Girl, but she slides smoothly into place here as part of a tremendous art team. Current and original artists Derek Charm and Erica Henderson each take an "era" of Squirrel Girl along with Ms. Franquiz, and Rico Renzi's colours unify the entire narrative. The different iterations of Squirrel Girl provide the perfect set-up for integrating three artists' work, and "Choom"-ing through time with Kang rotates us through three takes on our hero. They are all distinct - in style as well as character design - and all appealing. Erica Henderson wins my top honours, though, for both her super-adorable Kid Squirrel Girl and her gloriously sneer-y rendition of Kang's face. Because there's timestream-meddling afoot, this story shows us both a bad and a good future for Doreen. The good one is magnificently heartwarming, and it delivers another powerful payoff for grown-up fans who want to see Something More in Nancy & Doreen's relationship. Present Doreen gets a pretty heartwarming epilogue, too, including a nifty new piece of gear that I hope gets used in future stories. My one complaint here is that Kid Doreen and Monkey Joe don't get an epilogue of their own. It's a celebratory milestone issue, it's entirely self-contained - couldn't it get stretched for a few more pages? Unbeatable Squirrel Girl #42 is a profoundly satisfying one-shot that shows Kang the Conquerer learning what other Marvel villains already know: You don't mess with Doreen Green. A whip-smart script, an outstanding artistic shuffle, and gobs of fearless humour make this a perfect celebration of Squirrel Girl's 50th solo issue. Ryan North is so much better than me at funny footnotes, I'm just gonna steal one of his: "Anyway! To celebrate Squirrel Girl, here's a dark future where everything's gone wrong!"